If you are in need of Mortgage Financing for Real Estate in West Palm Beach, Florida you have come to the right place. I am a local West Palm Beach Mortgage Broker with over 23 years experience helping happy clients all over the state of Florida. Mortgage Brokering is once again on the rise. During the last 5 years I have primarily worked for banks but as of the start of 2017, I am once again on the brokering side and loving it. There #1 reason is that I am able to move the file fast. Whenever possible I like to deal with the #1 wholesale mortgage lender in the country. They have unbelievable pricing, service and technology which in turn allows myself to offer wonderful prices, service and technology. My first three loans of 2017 took 14 days, 14 days and 17 days respectively. Back in the old days of banking it was rare if I could get a loan finished in 45 days. In addition to dealing with the largest wholesaler we have specialty niche sources that go a little further than your typical banking channels. Currently I have a special niche FHA source that can accommodate credit scores as low as 550. The last major advantage of Brokering over banking is documentation. Documentation on the client is much easier than if you are going to a bank. A bank tends to over document because they will need to sell that loan on Wall Street after you close. If you are sending your documentation to the source that ultimately will service your loan, they can cut corners if they want. Sometimes they do in the name of service. 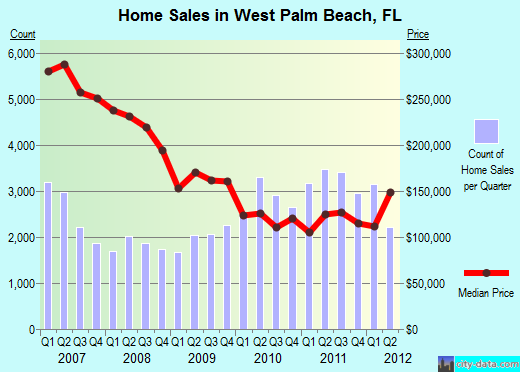 As part of my work as a Florida Mortgage Broker, I keep track of home prices for each market. I lived 14 years in West Palm Beach west, currently I reside in Lake Worth east. Please see attached graph furnished by City-Data. The expectations for 2016 is that more inventory will improve. Interest rates are expected to nudge somewhat higher as our government slows the systematic purchases of American mortgage back securities and begins to raise the federal funds rate. Visit my mortgage rate lock advisory page to get opinions of experts smarter than I am. Please keep in mind that West Palm Beach including the isle of Palm Beach has an amazing array of different types of settings and homes to choose from. This entire area covers over 55 square miles! Here is a video that I prepared that provides more insight on the area. 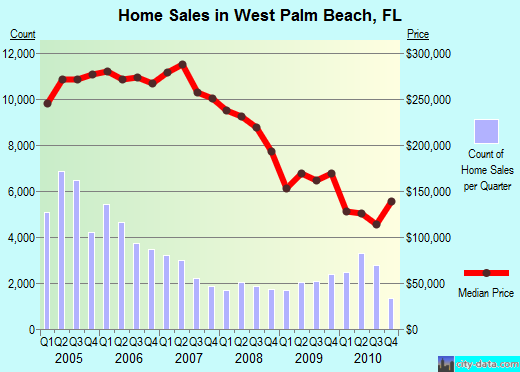 (2012) Some believe that reduced lending costs for all borrowers are contributing to the demand for homes and home loans in West Palm Beach. Interest rates for FHA continue to trend lower towards the low 3's and interest rates for Fannie Mae Financing are hovering in the mid-3's. The general consensus is that interest rates will start to trend higher towards the end of the year. More 2011 News - Comparing this graph provided by the folks at City-Data and comparing values to the previous year, it seems that home prices are bouncing along. Borrower costs have also lowered since the last time we did this exercise. A typical FHA rate is around 3.75% today where a year ago it was around 4.0%. Nevermind West Palm Beach Foreclosures or West Palm Beach Short Sales, your mainstream purchase of a West Palm Beach home sold by a West Palm Beach homeowner looking to move on will yield a very nice home at a very affordable price. Prices range from the $100,000's to the $1,000,000 depending on square footage and fix up and neighborhood of course. West Palm Beach Demographics - Here is a very helpful page that provides demographic information regarding Palm Beach County and West Palm Beach. West Palm Beach, Florida is where I made my home for 14 years. If you are a relocation customer or even a corporate relocation customer I would be glad to offer you my advice. Here we have an interesting contrast of people and homes. To the east we have the Isle of Palm Beach and too the west we have 1.3 acre lots and rural lifestyle. In the middle we have a whole lot of excitement and something for everybody. Reading in my Linked in account this morning I learned that a common complaint among relocation customers is that they feel that their realtor did not divulge all the negatives of a given area. "They just wanted to sell them a house." My answer to this statement is "Ask your mortgage banker!". I live here and I am working inside this market each and every day. Please keep in mind that when you are dealing with your realtor, it is more like a date and not a marriage. Keep your relationship moving forward and if you don't feel there is good chemistry, it is O.K to break up. I have a string of realtors who I feel are good so I can help you change to a better advisor or maybe just a different personality that matches yours. Another way to learn everything is with third party information. I appreciate this site, Palm Beach, Florida which is a kind of a travel/trade type web site aimed at pointing out some of the higher end places to go in Palm Beach county and West Palm beach including Boca Raton. For customers of mine who reside up north or in Europe or South America and are looking for a point of reference to begin their search in South Florida, I often suggest either Boca Raton or West Palm Beach. 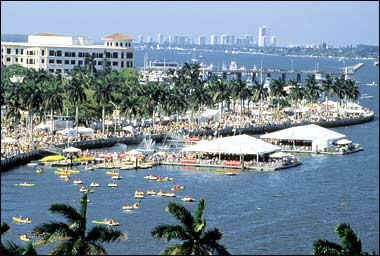 West Palm Beach is the oldest incorporated municipality in Florida, beating out Miami by two years. As you begin to explore the many neighborhoods of West Palm Beach, you will get a feel for the great nostalgia of the place. The area that became West Palm Beach was settled in the late 1870s and 1880s by a few hundred settlers who called the area, "Lake Worth Country." These settlers created a diverse community comprised of rugged individualists from many parts of the United States and the world just like today. The population of West Palm Beach quadrupled in the 1920’s, with all kinds of businesses and public services growing along with it. Then, after World War II, and improvements to modern air conditioning, many soldiers who had been stationed in this area began looking for affordable places to live. During the 1950’s, many of the mansions on the Isle of Palm Beach were built. These are the mansions that are still there today that make for that enjoyable site seeing tour on A1A. Sort of like Newport Rhode Island’s row of mansions, a tour of the island of Palm Beach gives you a feel for the big money and optimism that settled here back in the late 1950’s and 1960’s. With the expansion of everything in Florida in the 90’s and after, West Palm Beach continued its growth to the west, with numerous award winning communities. This area boasts everything from historic homes, to modern gated communities to sprawling countryside homes on tracts of one acre or more. 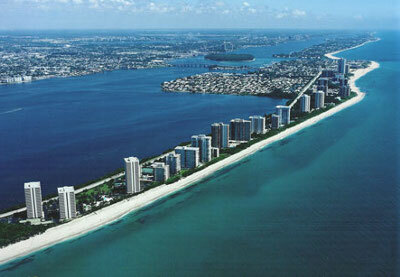 If you venture West of the Island of Palm Beach you will encounter the city of West Palm Beach. If you start to travel west and stop in a few miles, you will encounter fun places like City Place which is a downtown outdoor mall complete with live music, shopping and many night clubs and restaurants. Also the Clematis area is just next door covering a span of several blocks. Kravis Center Tickets - The Kravis Center is a great venue to go to downtown. It features a wide range of attractions from live bands to ballet to Sesame Street theater for the kids. This link shows all available shows at the present time. Lion Country Safari - Also we have a little Park known as Lion Country Safari. You can take the tour inside your car and see all of the animals up close. They even have an animal petting zoo where you can stand on a 20 foot platform and pet tall giraffes. And to top it off they have a playground and a water slide area for the kids. Palm Beach Zoo - The Palm Beach Zoo is open 363 days a year (364 on leap years! ), closing only for Christmas & Thanksgiving. Bring your group to the wildest place in town! With 1,400 exotic and endangered animals and 23 acres of beautiful tropical plants the Palm Beach Zoo is a delightful and educational outdoor classroom. Cruzan Amphitheater Tickets - Located near Wellington in west Palm beach off of Southern Blvd, this amphitheater also offers excellent concerts from time to time. See link for current ticket prices. 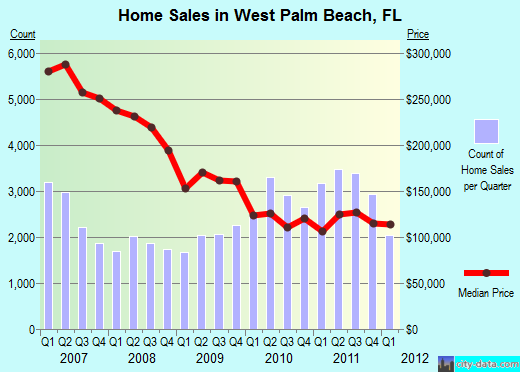 More Helpful Links for customers looking to purchase real estate in West Palm Beach Florida. Please give me a call if you need help arranging your financing.